[Harry Duncan O'Neill, Secretary of the Clerical, Medical and General Life Assurance Society.] Autograph Letter Signed ('H. D. O'Neill') to 'Hay', with copy of his privately printed 'Clerical Verses. 1889-1910. By H. D. O'N. ', containing 28 inserts. Book: [London?] Printer not stated. [Circa 1911.] Letter: on letterhead of 15 St James's Square, Pall Mall, SW [London]; 9 February 1912. For more about O'Neill (son of the Victorian artist George Bernard O'Neill) see his obituary in The Times, 15 June 1946. LETTER: 4pp., 12mo. Bifolium. In good condition, on lightly-aged paper. 25 Pall Mall [London]. 21 May 1847. 1p., 4to. In fair condition, on aged and creased paper, with slight wear and loss at foot. The company has received Sieveking's letter of 16 May 1847, and Neison is 'glad you have referred to the subject of the Medical Referee at Hamburg. Your opinion agrees so much with that expressed by Mr. [Waddilove?] that there is no doubt our Board will follow it. | We shall be glad to see you whenever in the neighbourhood'. Note: "Dr Edward Sieveking was a prominent member of several sanitary reform associations". [The Western Fire and Marine Assurance Society.] Manuscript 'Statement of the Affairs of the Society and Resolution proposed to be read and discussed at the Special Meeting of the Manchester Direction on Tuesday October 23d 1866'. 4pp., foolscap 8vo. Bifolium. In fair condition, on lightly-aged and worn paper. In two hands, suggesting collaboration. 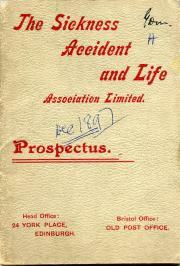 The Sickness Accident and Life Association Limited. Prospectus. 12mo (leaf dimensions 13 x 9 cm): 62 pp. Folded 'Proposal' tipped in on perforated stub. Sewn into cream wraps, printed in red. Text clear and complete. Internally tight on lightly-aged paper. In worn and grubby wraps with a few ink notes on front. Index on p.ii (reverse of front wrap) gives sections (each with subsections) devoted to Sickness Department, Accident Department, Employers' Liability and Accidents to Workmen, Indemnity and Third Party Insurance, Fidelity Guarantees, and Life Department. Also lists Directors, Office-Bearers, Head Office and Branches. The causes of death among the assured in the Scottish Widows' Fund and Life Assurance Society from 1874 to 1894 inclusive. Edinburgh: R. & R. Clark, Limited. 1902. 4to. Pages: viii + 103. Appendix consisting of nine detailed actuarial tables. Tight copy, in grubby, stained and worn printed paper boards. From the library of the librarian of the Medical Society of London, Nehemiah Asherson, and with the Society's oval stamp on the verso of the title. Small circular label on front board. Autograph Letter Signed to William Haines. 18 October 1838; '2 Maddox St. Bond S London'. English artist (1809-42). One page, quarto, with the second leaf of the bifoliate bearing the address ('To | William Haines Esqr.. | Sol[icito]r. | Cannon Street | Birmingham'), with the remains of a red wax seal, and two postmarks. Discoloured, and with damp stains causing discoloration and damage to the paper, but not affecting the legibility of the text. Small spike hole through both leaves, not affecting text. Having been 'from home yestereday on a painting expidition' he could not acknowledge Haines' letter sooner.